In late February 1928, about two weeks before the dam broke, 18-year-old Hetta Laurena Carter shot this photograph of a mortar box, hoe, bucket and garden hose, used to plug a leak with "sloppy cement." "It was end of February (1928), which would make me 18 years old. I had been driving for a while, and it was just fun to drive. My dad had an old Chevy, and I drove the old Chevy all over the country. "I walked a little closer, and it was a half a sack of cement in the mortar box. The box also held a wooden hoe and a bucket, and the tip of a garden hose. 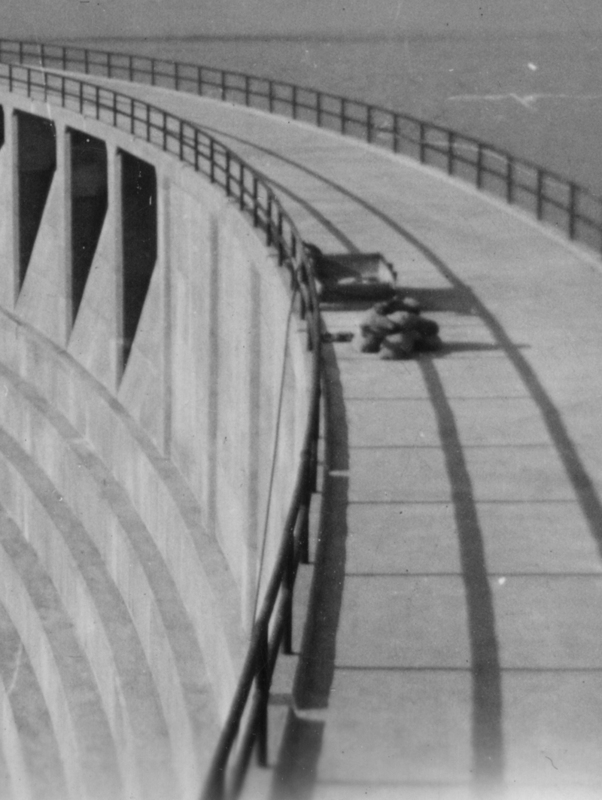 The hose was down the side of the dam, so I immediately guessed that they were making sloppy cement in the mortar box, pouring it down the hose to (fill) a small leak that was on the side of the dam, about halfway down the dam." HC2801b: 9600 dpi jpeg from original print.